Are you familiar with the TV show that aired in the early ’90s called Northern Exposure? It’s about a New York Jewish doctor who is forced to be a physician in Cicely, Alaska, for four years. His culture shock includes moose wandering the streets, coping with a landlord who might or might not provide service when the plumbing breaks, mysterious foods, and people who accuse him – the doc – of causing the town’s flu epidemic. So happy to be home! 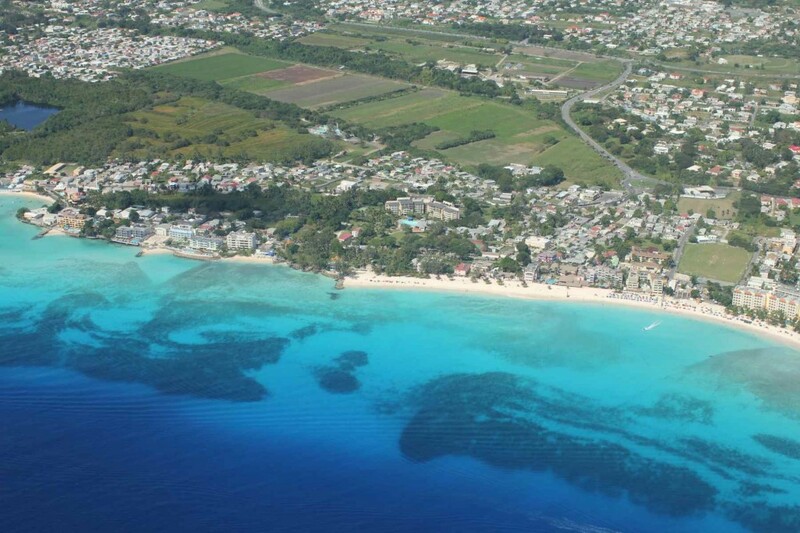 Flying into Barbados (I took this Jan 2, 2011). This month marks my third anniversary of having moved to Barbados from San Francisco. I wasn’t forced to come to Barbados – I came for love. But some of my less-pleasant early culture-shock moments include being passed over at the fabric store while everyone else in line got waited on, a clerk at a sandwich shop who made me cry, sand flies feasting on my ankles, and the good strawberries looking like boxer Frazier’s face in ’71 after Ali finished with him. Today, far more comfortable in my new home, it makes me laugh to remember sand flies or crummy strawberries or rude clerks. Newcomers to a place stand out like raisins in pudding; never do they fit in at first. My vulnerability called out to clerks with a sadistic streak. My reference point was San Francisco. No wonder I was dissatisfied with the produce. The Caribbean Sea outside my Barbados home. The route to fitting in is almost like a hazing – an initiation rite: you have to suffer through all manner of discomforts before you fit in. What I’ve learned in these three years is that culture shock matters in the moment but doesn’t matter at all in the longer term. That’s because culture shock isn’t about the culture, it’s about us and our not yet knowing the ropes of a culture or having a place in it. Even with his frustrations, the protagonist of Northern Exposure steps out of his cabin each morning and gasps at the majestic work of Mother Nature. 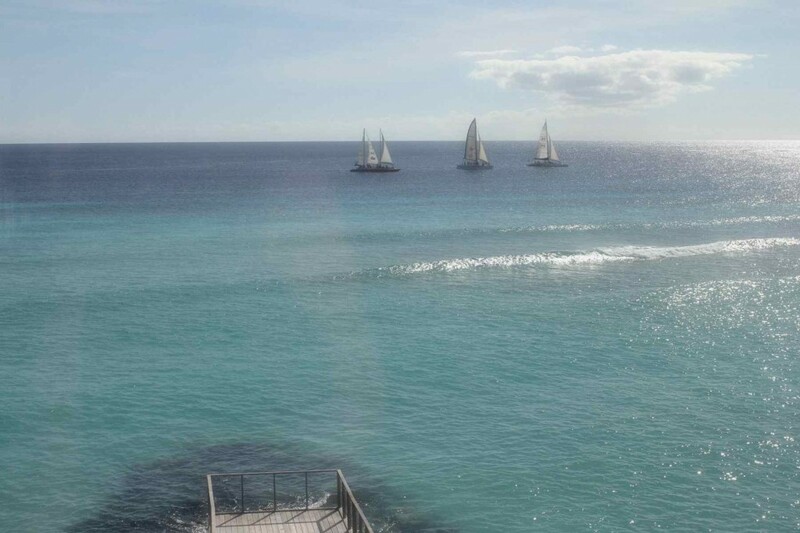 Likewise, I awaken to the brilliant blue Barbados Caribbean Sea. This, forming a few relationships that matter, and satisfying work … this is what ultimately ties us to a place. I fit in. Happy Anniversary, Me! I’m grateful. Thanks for reading; I appreciate it and I adore your comments. If you would, please, visit me (and “like” me) on Facebook? I post little 20- to 60-second video “beach reports” and other fun things … thanks! By the way .. Happy New Year! I wish you a wonderful – happy, joyous, and free – 2011. Happy Anniversary! Glad to see you back. I was in Barbados in early December. Hope to get back in April for Easter. Glad that you are enjoying Barbados…there is nothing like the Caribbean. You just keep posting about your life in Barbados. Those of us who love the island love reading about your adventures. This blog has been a bright spot for me. I like your facebook stuff too, but here you go into more detail and that I love. Amen to needing time to go through the “hazing” period. I have “worked” very hard in my now almost 8 years here to fit in and actually get smiles from those once rude clerks. We were just in Grenada, an island I am very fond of, and our table of four got such rude treatment from a waitress that I actually cried. There at a table in a very nice restaurant, I cried because I was so horrified by our treatment. I was very happy to get back home and have the wait staff in our regular haunts give us our drinks without even ordering. 8 years and thriving. Happy Anniversary Jane. I just stumpled across your blogs, and have enjoyed reading them and comparing them to my experiences of Barbados living. Having lived in Barbados for six (I have just relocated back to England) I can definitely relate to dealing with culture shock, and adjusting to the laid back lifestyle that took a lot of getting used to. Initially I too used to get passed over in Abeds and sewing world as I patiently waited for my time to be served, or spoken to as though I wasn’t speaking English but a foriegn langauge that was completely incomprensible. I’m glad I stuck it out and managed to call Barbados my home for many years, but as life goes, I got home sick and left Barbados at the end of last year. So although I’m not missing the country as yet, it is nice to look back and reminisce whilst reading your blogs. Thanks for your comment, Caribista … You lived here in Barbados for six years! Wow, you must be suffering culture shock being back in your home country again! It rarely happens now that I get passed over at stores; I think rude salespeople can sniff out a newcomer to the island and exert power over the newbie. An old-timer (if I can be called that after just 3 years) is not going to take being treated badly well at all, so it rarely happens now. I will be interested to hear when you start missing Barbados, Caribista … ! Let me know, please … I’ll be curious to hear. Thanks, Cookie. To make someone cry … that’s truly unforgivable. I know you won’t judge the whole country of Grenada based on this experience …. although, of course, tourists to Barbados judge their experience on how they’re treated, don’t they? That’s always the bottom line … how we’re treated by others is how we judge an establishment — or a whole country. Great find! I love the blog and the beautiful pictures. I left Barbados almost 40 years ago at age eight, and I’m longing to get back there permanently. Soon! There is a little of a culture shock for us “Bajan Yankees” (I don’t like that term) as well. But…I feel the island calling me more and more the older I get. I guess that’s why I’ve been there so many times this year. I should be back soon and hopefully stay for a good while.